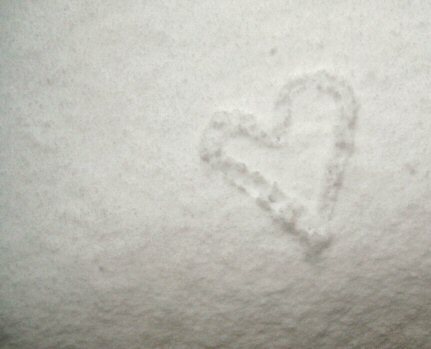 February has an extra day this year- must be to make room for all these hearts. 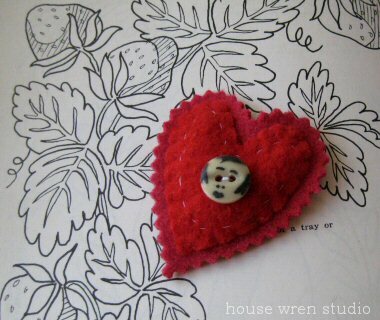 I've been saving this little felt heart for today because I'm headed to the airport to pick Dede up for a weekend visit! She introduced me to these vintage baby face buttons more than twenty years ago...and we still love 'em as much as ever. I mean, really, who wouldn't? Speaking of lovely packages in the mail, this arrived for Valentine's Day from my friend. What a sweet and unexpected surprise! I love everything about it, but most of all, simply that she made it for me! 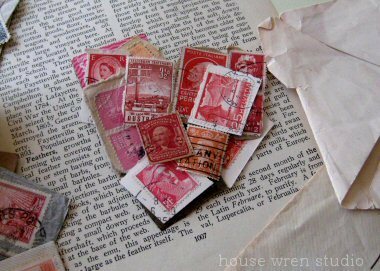 One of my neighborhood friends brought me a packet full of stamps- torn from envelopes, collected over generations, squirreled away for their imagined value or memories perhaps. Funny how most of us would now rather have the letters inside the envelopes, the handwritten thoughts more and more precious as we move farther away from the pen and ink tradition of letter writing. By now you know that I have many, many buttons. This one is from a set of four and they appear to be handmade. Whatever they are, I do love them...all four. 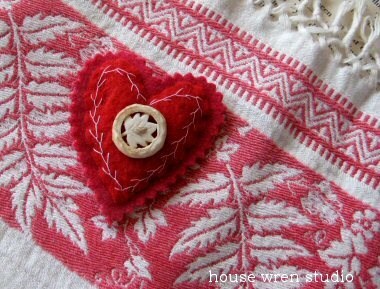 Like the button from Erin's lost sweater, this one is perfectly at home on the red wool doll shawl. 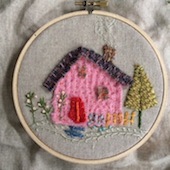 But I think my favorite part is actually the simple feather stitch which makes me feel as though I am following the traditions of my grandmother. She probably called it goose tracks, sensible country girl that she was. Each time I start that stitch I have a moment when I can't remember the how and why of it. Which way does it start? Where do I come out with the needle? And then it comes back to me, Here, then there. O, this is fun, I could stitch this pattern forever. The red and white textile was thrifted so long ago, I can't remember where, but is one of two, both so treasured that they hardly ever come out of the drawer. That's kind of silly. 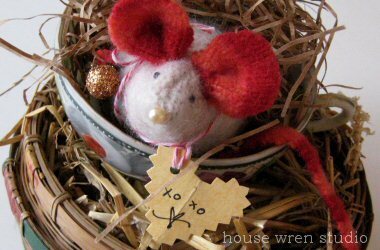 I am giving this little tea mouse away in a comment drawing Monday evening. 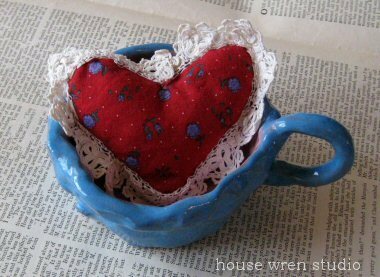 She needs a name and is really very sweet, all snuggled up in her nesty vintage teacup, handpainted by someone long ago. I so loved reading those comments yesterday (which are already included). Thank you. Continuing through the weekend and Monday, just leave a comment about your own imagined or real pieced heart - or you could suggest a name for her- and I'll put your comment in the basket for the drawing. We have two ML's here. Finally figured it out. 3K - only one of them had Mrs. Kemper in 3rd grade. Maggie. Whew. Would hate to not have that straight, right? 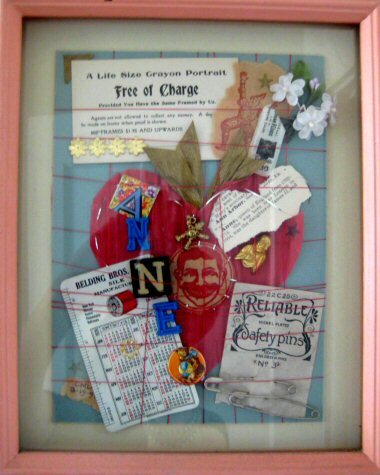 These are Maggie's found hearts she collected over the years, dragging them back and forth across country from move to move and then finally placing them inside this shadowbox for me, for my birthday a few years ago. 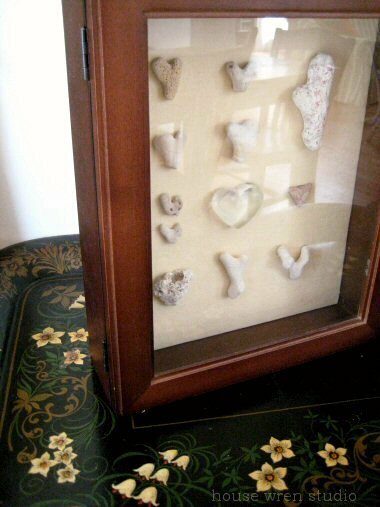 Every time I look at it I am reminded of her, my dear and funny Mags, her eye for artful things, meaningful things that we prize as a family of collectors. And of course, her sweet thoughtfulness so like her sisters too- the heart-shaped treasures I value most. She stopped by Monday and we went for a walk in the super mild weather that felt like spring except that it's February. (Today we are back to winter.) She wanted to hear all about the trip to California- maybe you do too. After arriving in LA, I spent a wonderful afternoon and evening with our friends near Pasadena. I loved being with them- to sit and talk, look through their photos of the wedding, imagine how in the world we are going to do this too. Teresa arrived that evening and we all walked the aisles together the last day at the show. Perfect wrap to that part and then serious reunion crafting, shopping and exploring. Planning to share all that with you, in a way that you can fully appreciate the best of it. Hoping we can- more on that later as it comes together. The collage I made for her birthday in '91. Wish we were there to celebrate with you~ have a happy, happy day! and many, many more to come! xoxo! Church sale 2007. The painting on top! 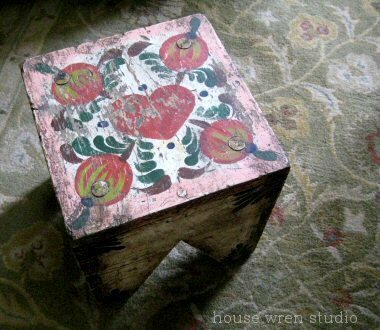 I absolutely LOVE the Peter Hunt (Provincetown folk artist) vintage style on anything. 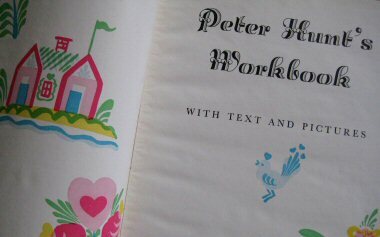 I have one of his workbooks and used to have a fabulous old piece which we called the Party Cake table. It was a cut down library table painted in the 40's or 50's by a woman using his methods and style guides. 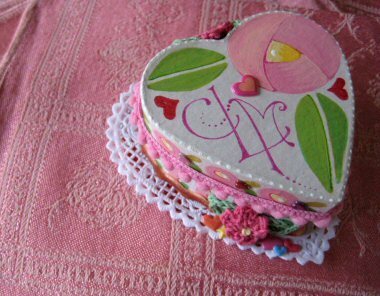 Decorated with fanciful painted place settings, each had a big strawberry shortcake in the center plate. The girls spent hours coloring there, conducting tea parties, playing school in little thrifted chairs to match. Found that table at the Kane County, IL flea market, but I reluctantly sold it here in NY when I thought it was time. Probably should not have. On the other hand, this little piece is so sweet- and just has to be sweet enough. Not even much room here for that.